Take a look at your home. Some versions of sunrooms are easier built than others. The sunroom that depends and leans on the larger structure are easier to design and built. It also optimizes heat and cold through the respect months. Decide where the best location for a sunroom would be. Some say the better results measure approximately 15 degrees of solar south. Solar south isn’t the same direction as compass south. If you need help determining which direction is solar south, you should call the local weather station. Determine which materials you will use for your sunroom. 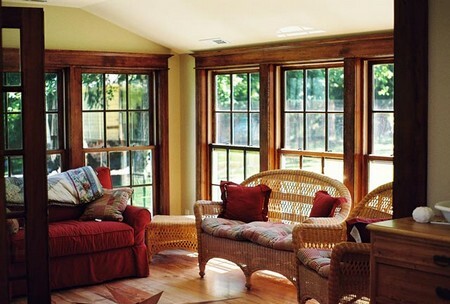 You want to make your new sunroom as energy efficient as possible. Sometimes, this aspect may be difficult to achieve for do it yourself projects. Build it yourself sunrooms can lack in efficiency when compared to professionally built sun rooms. If you want to create some balance a bit, you can use energy efficient materials. Slab formations and brick walls are examples of efficient sunroom details. You’ll need to hire a handyman. You’ll also need Plumbers and Electricians to finish your sunroom properly. You need all of your amenities to be properly installed and done. It is recommended highly for you to procure a professional to construct and lay the foundation of your new sunroom. I would not cut any corners. Professionals should be consulted at the very least. Sunrooms kits are goof to use. These are designed and used by other professionals. They are recommended very energy efficiency and reliable. These kits work to drastically reduce the number of small details that need to be considered and may easily be missed by the inexperienced designer. Sunrooms may be called by different names. They are also called greehouses, patio rooms, conservatories and solariums. Sunrooms that have a uneven slant to the roof are easier to build.They are supported by the main structure.They can give the home the best heat when it’s cold and the share spacing as well. They can be built in various styles. A kit can drastically lower the work it takes to uild a sunroom. Boards that are cut on a slope to fit certain measurements are included. These make the design precise and clean.The kits are a life saver when you want to plan and execute the buid of your new sunroom with relative ease. There is no fuss. Just the added convenience of precision.